The hunt for signs of life on seven nearby exoplanets will likely begin just a few years from now. This combination of proximity and potential habitability makes TRAPPIST-1 an inviting target in the search for E.T. The team continues to study the TRAPPIST-1 system with Hubble. But such work can characterize atmospheres only in a relatively broad sense; the hunt for possible signatures of life such as oxygen and methane will require new instruments, the researchers said. Luckily, such gear will be online soon. NASA's $8.8 billion James Webb Space Telescope (JWST) is scheduled to launch in late 2018, and three huge ground-based instruments — the European Extremely Large Telescope (E-ELT), the Giant Magellan Telescope (GMT) and the Thirty Meter Telescope (TMT) — should start observing the heavens by the early to mid-2020s. Indeed, the TRAPPIST-1 system will likely be one of the first targets for JWST once the telescope is operational, Nikole Lewis, an astronomer at the Space Telescope Science Institute in Baltimore and co-leader of the 2016 Hubble study, said during a press briefing today. JWST's observations should allow astronomers to get a good handle on the TRAPPIST-1 planets' atmospheres by the early 2020s, Lewis added. Detecting either oxygen or methane by itself in a planet's atmosphere wouldn't be compelling evidence of alien life, because both of these gases can be produced by abiotic as well as biotic processes, astronomers have stressed. Finding the two of them together, however, would be a different story. "They destroy each other," Shawn Domagal-Goldman, a scientist at NASA's Goddard Space Flight Center in Greenbelt, Maryland, said in 2014 during a NASA panel discussion about ancient Earth and habitable exoplanets. "If they're both there together, you know someone is bringing the methane in an atmosphere rich in oxygen, so that's what you're looking for. The most likely explanation is, it's life that's bringing the methane and oxygen to the party." So astronomers will likely search for methane, oxygen and other gas combos in the skies of the TRAPPIST-1 worlds when JWST and the big ground scopes become operational. 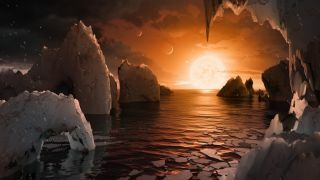 But even success on this front would not necessarily provide universally accepted, slam-dunk evidence for life, said Michaël Gillon of the University of Liège in Belgium, leader of the new TRAPPIST-1 study. A robotic probe won't be zooming through the TRAPPIST-1 system anytime soon, but this prospect is not out of the question. Last year, a team of scientists and engineers announced the $100 million Breakthrough Starshot project, which aims to develop the technology required to blast tiny, sail-equipped probes through space at up to 20 percent the speed of light using powerful lasers. If Breakthrough Starshot pans out, such spacecraft could conceivably make it to the TRAPPIST-1 system about 200 years after lifting off.